My party fought some Runeflame Skeletons this weekend, and they have a tendency to set things on fire. Basically, they can go insubstantial and move 8 squares, setting everything on fire as they walk around it. The fire then blocks line of sight. They also have a nasty aura that stacks, causing damage to those poor souls 3 squares around them. 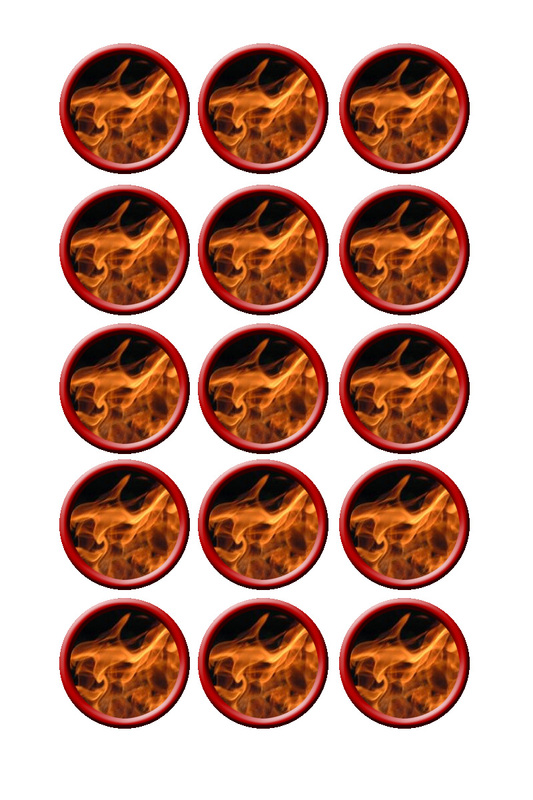 I wish I would have thought of these tokens earlier in the week, so I would have been able to use them in the game. Basically, they’re meant to be placed on those squares that are on fire. They are easy to move around if the fire spreads, or if the skeletons use their power again somewhere else. Here you go, hope someone finds them useful. Maybe some ice ones will come in handy, or fog, or spider webs, or… nah, I’ll just stop. you have no idea how perfect this is for me right now. my players will come up against fire next week. That’s a good idea. Riffing off your further thoughts (which are all worth exploring), how about some general “temporary difficult terrain” tokens? Very cool. Of course, it won’t surprise you that I use these.